This is the first translation of the entire Bible to be published in Cornish. Translator Nicholas Williams based the text on the original languages together with a collation of several other versions. Wherever possible, personal and geographical names are those attested in traditional Cornish. The volume contains 10 maps, in which all the place-names appear in Cornish form. H m yw an kensa trailyans a'n Beybel Sans dhe vos dyllys in Kernowek. An Beybel yw trailys gans an Pendescador Nicholas Williams, an trailyor Kernowek moyha y hanow i'n present termyn. An kenscr f a'y drailyans a veu gr ndys w r an y thow gwredhek hag y feu comparys gans versyons erel. Wosa hedna an scr f a veu r? 's dhe Gernowegoryon dh, neb a gomendyas amendyansow hag indella gwil an trailyans moy sy dhe redya. Nena an trailyor a sarchyas oll an textow in Kernowek Cres hag in Kernowek Adhewedhes -- gwariow merkyl, homylys ha darnow mes a'n scryptour -- rag cafos devydnow a'n Beybel in Kernowek teythyak a alsa bos sys in y drailyans y honen. Darnow a'n par-na in mes a'n textow re beu gorrys in kenyver tyller possybyl dres an Beybel, hag ymowns y ow qwil an trailyans dhe voy warrantus. Mar bell dell yll bos henwyn personek ha henwyn tyleryow i'n trailyans-ma yw an henwyn poran a gefyr i'n textow tradycyonal. Yma deg mappa i'n lyver, mayth usy oll an henwyn warnodhans in form Gernowek. An Beybel Sans yw screfys in Kernowek Standard. -- This is the first translation of the entire Bible to be published in Cornish. The translator of the Cornish Bible is Professor Nicholas Williams, the foremost present-day translator into the language. The first draft of his translation was based on the original languages together with a collation of several other versions. Next the translation was reviewed by a number of competent Cornish speakers, whose comments helped improve the readability of the work. Thereafter the translator searched the Middle and Late Cornish texts -- miracle plays, homilies, and portions of scripture, to find all those passages where native Cornish renderings could be used in the translation. Such passages by speakers of traditional Cornish have been incorporated throughout the Cornish Bible, and add to its authenticity. Wherever possible, personal and geographical names are those attested in traditional Cornish. The volume contains ten maps, in which all the place-names appear in Cornish form. 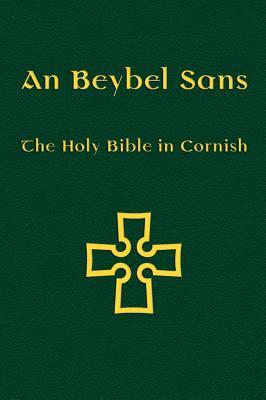 An Beybel Sans is written in Standard Cornish.